I spend a lot of time in the FamiLAB metal shop making things, maintaining machines, and sometimes just enjoying some order and organization. 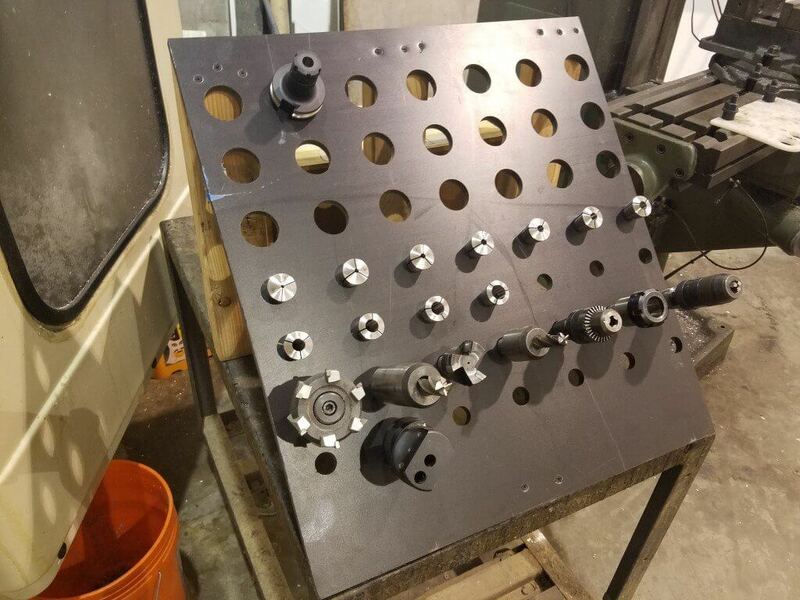 Our collection of tools and toolholders for the various mills, lathes, saws, and grinders is ever growing, but our storage situation had stagnated. This led to tools rolling around in the bottom of drawers, getting lost, forgotten, and damaged. I’m on a mission to fix that through any means necessary and make the metal shop an organized and efficient place to make things. In the past I have shadowed tools in foam which has worked extremely well. This time around, I wanted to get the CAT40 and R8 toolholders for the Bridgeport vertical mill and the HAAS VF-1 Vertical Machining Center out of the toolbox and somewhere easily accessible. I wanted to make something cheap but sturdy that puts our tool inventory in view and in reach, without having to move anything out of the way in order to access a tool. This is what Adam Savage of Mythbusters fame calls “First Order Retrievability”, and it is a strategy I am moving towards at the lab and also in my personal tool kit. You can read more about it here. We had a spare cart floating around the shop that was 2ft by 4ft and had no additional shelving or drawers underneath- Just what I needed! Having to reach under something takes extra time, and inevitably leads to lost/forgotten tools or tools that are not put back. This would be a dedicated cart for this purpose. I already had a simple idea in my head for the organizer: An angled board with a grid of holes in it. I could have accomplished it with a couple of hole saws and a drill, but this is FamiLAB! On that note, it was off to the wood shop to find some scrap material for this project. I found a 2×4′ sheet of black…something. I initially thought it was MDF, but cutting it proved it was something more plastic-y. After securing my stock, I cranked up my laptop and Autodesk Fusion 360. I drew a 2×2′ square to represent half of the material I had on hand, then looked up the dimensions for CAT40 and R8 tool holders. 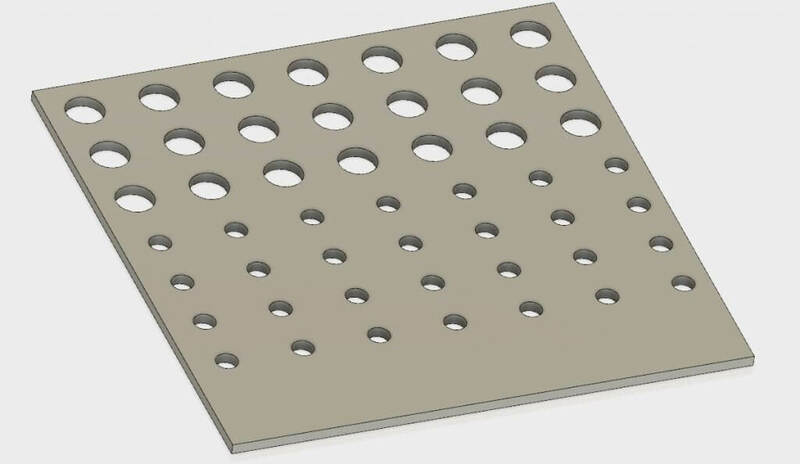 CAT40 toolholders are 1.75″ at the base of the flange, and R8 toolholders are .94″ (I rounded to 1″) on the straight part of the shank, so I made two rectangular patterns of holes and extruded the resulting geometry. Great! Now I have my basic shape, and have to convert that into Gcode- The instruction language for most CNC machines out there. In this case, I am using the 4×4 CNC router in the wood shop to bore these holes. 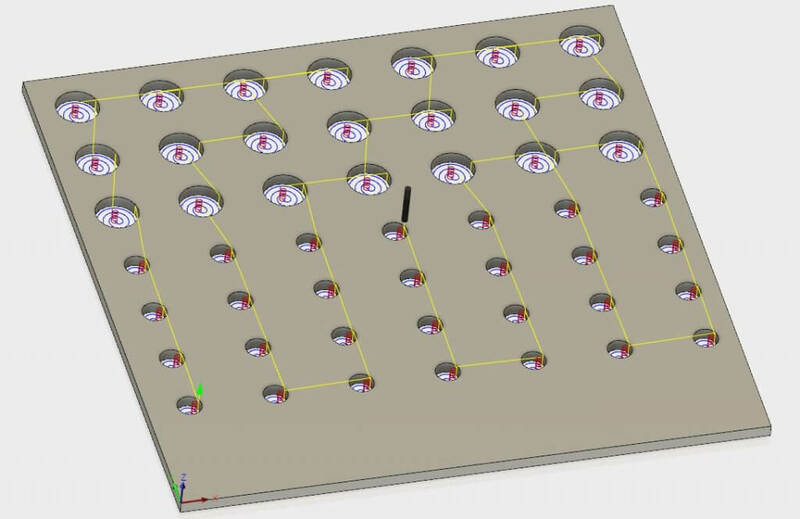 By moving from the Fusion 360 “Model” space to the “CAM” (Computer Aided Machining) space, we can also write the toolpaths. I select a simple Pocket operation, highlight the holes I want to bore, and select the tool I am cutting with. I select a 1/4″ router bit, and adjust the speeds and feeds to an appropriate value for this material: 12,000RPM and 50 inches per minute feedrate, with a 20ipm plunge. This results in a total runtime of about 15 minutes- Not too bad! I exported the resulting toolpath with the TinyG postprocessor that matches the Gcode flavor our router prefers, and walked over to the wood shop. I clamped my work to the bed, loaded my bit, set part zero on the front left corner (matching my origin location in Fusion), and got ready to run the part. After double checking everything, I turned on the dust collector, powered up the spindle to the prescribed 12,000 RPM, and pressed go! There is always a little “pucker factor” when you press go for the first time on new code. I always keep a hand on the E-stop just in case I made a horrible mistake and the machine breaks a bit, crashes into a clamp, tries to bore a hole straight through to China, or similar. It’s a good habit to get into, and when you first start playing with CNC machines you need it a lot! Luckily, all went well and about 15 minutes later I received a text from the machine letting me know my job was done. I removed the workpiece from the machine, table-sawed off the excess stock, and test fit a tool holder. Perfect fit! All that remained was making some simple miter cuts on a 2×4 to build the angled support, and voila! 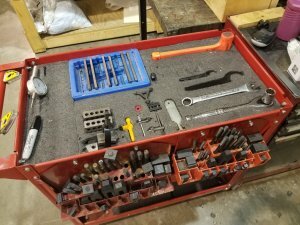 A great looking tool organizer for $0 (Using scrap materials) and less than two hours from start to finish. So cool! Such efficient (and aesthetic) use of scrap. Bravo!